Those who don’t know, Amazon kindle is an eBook reader. Its Amazon’s one of the best selling product. Kindle is really hard to find in stores near you. But the solution is simple. You can buy it online from various Indian shopping sites or you can also directly order from Amazon.com. Yes this is the only device which they will happily ship to any address in India and infact they ship it internationally. Just change the postal address and buy it with a credit card. But there are also some other options to buy Amazon Kindle in India. So those of you who are searching for other places to buy Kindle, then thankfully we also have some Indian shopping sites which can deliver this baby to your doorstep. Two variants are available. Wi-Fi model is available for Rs. 8990 and Wi-Fi + 3G model is available for Rs. 11990. Check out these models from Indiatimes. 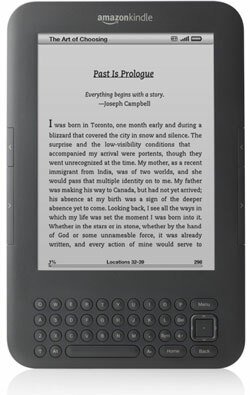 Kindle Wi-Fi + 3G model is available for Rs 11,000.00 and kindle Wi-Fi (Graphite color) is available for Rs 8400. You can just hit this website and its listed on their homepage. Wi-Fi, with 3G and Graphite color costs Rs 13,000. Just search on ebay.in and you will find this model. But it depends on the seller which one he lists on the site. You also need to consider some various factors like shipping and in how much days they will ship the product. India Plaza and indiatimes can accept payments through Indian credit cards, debit cards, net banking, cheque and demand draft also. If you don’t have any credit card, then india plaza may be a good choice for you. Ecommerce in India is growing and with that, these sites are competing with each other. Its said that competition creates an open market and ultimately is beneficial to customers. Note: The prices mentioned here are just for your reference and the prices may change at any time.